Dorset remains one of the most frequented holiday spots in the whole of the UK, not just the south of England. Incredible lengths of sandy shores, stunning historical locations, lush nature spots and plenty of tourist trappings for all the family – it’s all here for the taking. Whether you prefer to take a trip around a stately home or castle rather than a trip to the beach, there are plenty of ways you can help make a Dorset holiday your own. Whether you’re heading out as a couple, on your own or with members of the family, Dorset is full of wonderful surprises. In this guide, we’ll explore some of the more popular and worthwhile haunts for you to explore while you’re in the neck of the woods. Fancy taking a. Trip down a historical trail? Interested in looking out to sea? Your Dorset holiday is what you make it – let these ideas simply be here for inspiration! While much of Dorset has had to move with modern times, much of its façade remains untouched by modern advances. That means you’ll feel as though you are truly stepping back in time when you visit one or more of the county’s celebrated market towns and villages, which still stand proud today. Dorset’s attractive array of historical and picture-postcard towns are often enough to appeal to a huge number of tourists each and every year. There’s nothing quite like the old quaintness of a seaside town. Beautiful historic towns and market regions such as Dorchester and Sherborne, for example, are always a sight to see and a pleasure to explore. Yes – you’ll find free Wi-Fi and cash machines here and there – but it still feels as though you are trekking back to a forgotten age! Don’t pass up a journey into historic Dorset without sampling the county’s wonderful seaside communities the next time you visit. For a catch-all holiday adventure to appeal to all ages and tastes, you can hardly beat a closer look at the wonderful Moors Valley Country Park and Forest. Based in Ringwood, the Park is host to wonderful, peaceful nature trails, biking trails and more than a few interesting bits and pieces for the little ones to explore. Children will love to explore the Go Ape Tree Top Adventure – where you can work your way through the famous forest from its very tops. Make use of ladders, zip wires, tunnels, bridges and more! There’s also a nice little Play Trail which will keep even the youngest of visitors happy and occupied. For adults, however, there’s plenty of tranquility in store. There are over 1000 acres of breath-taking parkland and forest here, all on show for you to trek around and explore at your own speed. You can even download an audio trail for your smartphone if you fancy a handy guided approach to walks around the resort! While Dorset is home to some of the most serene and breath-taking coastlines and beaches along the south coast, there’s something particularly special in store for you over at Lulworth Cove. This almost circular bay is smattered in white sand and pebbles, and makes for a superb little inlet where you can view the wider ocean beyond. It’s one of the most popular holiday hotspots for beach lovers and those in search of something a little more tranquil than your average tourist zones. Lulworth Cove is well-known for its impressive rock pools and for its dog-friendly admission. It’s extremely easy to gain access to, and is generally quieter to enjoy during off-season. The Dorset tourist board actively recommends you visit between autumn and spring for the most serene experience. However, there is certainly nothing stopping you taking a peek at the cove during the warmest months! Do be aware that it gets extremely popular between April and August! There are plenty of refreshment areas and toilets / baby change facilities on site, making it a safe and pleasant environment to head to regardless of where you may be staying elsewhere in Dorset. Make a beeline for the Cove if you’re down near West Lulworth! We can hardly talk about brilliant Dorset holiday ideas without mentioning the wonderful Jurassic Coast. Perhaps Dorset’s most famous asset on a worldwide basis, this UNESCO World Heritage Site is a natural rock and landscape array which stretches over 95 miles between Exmouth and Studland Bay. It’s impossible to cover it all in one sitting – which is why so many people take holidays purely to explore the sights and the towns incorporated along the way. The rock formations here – made up of sedimentary layers – are said to date back across 185 million years, and encompass at least three ages when the dinosaurs reigned supreme. For that very reason, the Jurassic Coast is a rugged reminder of an incredible past our planet has bore witness to. We’ll never be able to go back and see ancient Dorset ourselves – which is why it is all the more fascinating to explore the trail as it remains to this day. Each trip to the Jurassic Coast is a different one. Take a look at some of the quaint tows and resorts along the way, go fossil hunting, or simply take in the incredible views of the sea and coastline beyond. Much of this area of Dorset has been used in TV and film – and it’s not hard to see why from just a cursory glance! We never stop learning! 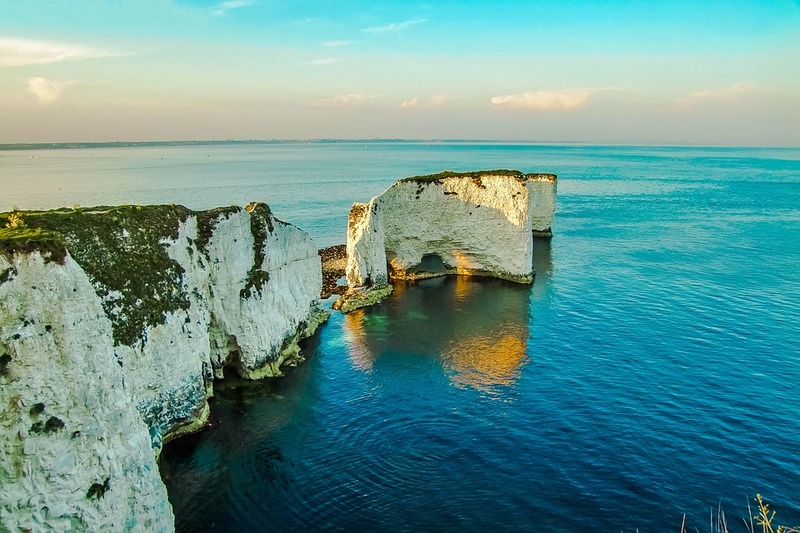 Dorset is famous for holding its heritage and history particularly dear, which is why the county is absolutely brimming with museums, galleries and collections for interested tourists and locals to explore. From the historical Lyme Regis Museum to the popular Beaminster Museum, there are scores of different historical and heritage collections which are keenly kept and shown to all who are interested in taking a closer look. Ever wondered what the Romans left behind in historic Dorset? Interested in seeing what some authentic artefacts from decades and centuries gone by look like after years of careful preservation? It is a great idea to take a look at the different museums and collections scattered across the county. The central Dorset Museums website is a fantastic place to start, where you can dip in and out of some of the more popular locations and sites before venturing out to take a closer look. All of Dorset’s museum facilities and attractions are very affordable and are maintained in the interest of educating and enthralling the visiting public. Certainly, if taking a look at our distant past is something which fascinates you, you’ll want to make room for a few museum stops on your next visit. As mentioned earlier in our guide, if you are taking a Dorset holiday, you should visit Dorset’s market towns have more to offer than just a few historic buildings and quaint, picturesque locations. You can also sample local produce and creations from a wide array of different local shops and businesses across the county. Interested in diving into some authentic Dorset antiques and collectibles? You’ll want to head straight for the Art and Vintage Quarter based in Bridport, as well as a number of independent retro and vintage emporiums scattered across the coast. In fact, you will likely find independent antiques and collectibles stores regardless of where you travel across the county. This, again, is prime evidence of Dorset communities taking great pride in their heritage! You’ll also find plenty of quirky spots and shops nestled in between, all with that authentic ‘local’ feel that historic England does so well. The county is also absolutely crammed full of art appreciators and collectors, meaning if you’re more fascinated by unique artworks and pieces than history itself, you’ll likely find more than a few galleries and private collections up for visitation regardless of where you head to county-wide. Corfe Castle is the name commonly used for the village surrounding one of Dorset’s most famous strongholds from medieval times. While the village itself has plenty of historic importance and bits and pieces for you to explore, you’re going to want to head straight for the castle itself if history is high on your list of priorities. Currently overseen by the National Trust, Corfe Castle stands nowadays as imposing ruins within the Purbeck Hills, where this defensive site has been constructed, dismantled and reconstructed again and again for various means over the centuries. It’s thought that Corfe Castle in its original form may have been made of wood, and may even have dated all the way back to Roman times! It was most famously restored for use by William the Conqueror around the end of the 11th century, and from there, it oversaw a number of sieges before falling into disrepair. It was bequeathed to the National Trust by the Bankes family in the early 80s. To this day, there’s incredible history to behold at the top of that famous hill – and the bustling village and marketplace beyond continue to court visitors, inspired by the deep, rich history of the castle that looks over it all. If entertainment is more on your agenda, then you are once again going to be spoilt for choice across the county! There are a number of traditional theatres and venues which are always ready to put on a show and exhibition or two across the year. Whether you prefer traditional theatre fare or simply fancy taking in a few classic movies, there are some spectacular venues and hotspots you’ll want to head to while on holiday here. Lyme Regis’ Marine Theatre is perhaps one of Dorset’s most celebrated traditional theatre units, where you can take in shows, community events, movies, concerts and comedy shows. It’s based on the edge of the seafront, meaning there’s a lovely view to act as a backdrop to all the hustle and bustle. Dorchester’s Brewery Square is probably likely to be more appealing to family audiences, and to those who prefer a more modern touch to their holiday entertainment. Brewery Square is just a small part of Dorchester’s dramatic regeneration over the past few years, where modern shops, eateries, bars and more are now easily accessible for you to dip in and out of at your leisure. There are also plenty of hotels here for you to book into when all is said and done. The Dorset tourist board has a huge selection of entertainment ideas for you to explore while you work your way across the county. There are far too many to list here, so why not take a closer look in your own time? While there are plenty of hotels and B&Bs dotted across the county, these aren’t the only options available for Dorset wanderers to camp down in after a hard day’s holidaying. Holiday homes offer wonderful comfort and affordable luxury that you can come back to year after year. There are plenty of great benefits to holding your own holiday property out on the coast! What’s more, holiday homes in Dorset arrive in all shapes and sizes. If you are interested in looking at static caravans or lodges in the region, you should consider taking a look at the wonderful Swanage Coastal Park, Swanage, on the isle of Purbeck. Situated in an area of rural beauty you will find you are never far from exciting walks and trails with breathtaking views of the surrounding areas on offer, with glorious beaches, rocky clifftop paths and castle ruins all close to the park. Wilksworth Caravan Park, based in Wimborne Offers spacious, affordable luxury, you could be coming home with wonderful Dorset coastlines right on your doorstep. Elsewhere in Swanage, you might also want to consider Swanage Bay View – a picturesque holiday home park where you can purchase and stay in your own lodge from season to season. If you’re keen to visit Dorset regularly, why not think about investing in a lodge or Static Cavan on the coast? If you’d like to know more about Dorset. take a look at our article on historical sites in Dorset.